Dr Dave Sloggett assesses the impact of the attack in Paris that saw one police officer killed and two others seriously injured. Events in Paris where what is believed to be a lone shooter stacks and kills a police officer days before the first round of voting in the French Presidential election provides a timely reminder of the anarchic way in which terrorism can manifest itself. So-called Islamic State (IS) were quick to lay claim to the attack. Coming days after Prime Minister Theresa May has called a General Election in the United Kingdom it also prompts an evaluation of what might happen if a similar attack where to occur. Some questions are obvious. What might a lone gunman or knife-bearing individual target? Have any patterns emerged recently to suggest that IS has decided on a specific type of target? Have they got the kind of command and control arrangements in place to actually prompt such attacks? Are we likely to see a surge in similar attacks in the United Kingdom before 8th June? Answering all these questions is difficult. The pendulum of attacks conducted by IS does appear to have swung towards the lone individual. Time and again in the past both Al Qaeda and IS have ruminated quite publicly on social media about why more lone attackers do not join their jihad. It is hard to think of a period in which such a tempo of attacks by lone individuals has occurred. For the Security Services one of their nightmares, an increasing rate of lone wolf attacks, is underway. Perhaps now we are seeing something of a wave of attacks suggesting finally that resistance to becoming involved is being broken. In London, Stockholm, St Petersburg and now Paris we have seen a series of lone individuals trying to attack iconic locations. Few would argue that the Champs-Élysées is the most iconic street in the world. Westminster Bridge under the shadow of the Houses of Parliament has a similar status. While the cumulative death-toll from each of the attacks is modest by comparison with the 7th July attacks in London, for example, or the attacks in November 2015 that saw 130 killed in Paris, the impact of the attacks occurring at iconic locations does suggest that IS have decided that it is not the death-toll necessarily that is at the heart of their strategy. They would rather lone individuals chose a place first and try to kill people using whatever means is at their disposal. The larger impact attacks, carried out by teams of people that are led by a former military commander, can occur less frequently to maintain the tempo of their activities. The failed attack on the famous Rialto Bridge in Venice is an example. The attackers came onto the radar horizon of the Italian authorities and were arrested before the attack took place. This was, as has occurred at least fifty times in the United Kingdom since 11 September, a timely intervention. Those larger-scale attack take time to plan and organise. And expose the groups to being detected as they plan their attack. While the majority of lone wolf attacks do result in relatively low death tools, compared to major multi-phased attacks by groups, the potential for a lone gunman to kill many people cannot be written off. In Orlando fifty people died when a gunman attacked a nightclub. In Istanbul thirty-nine people were killed and a further seventy were injured by Abdulkadir Masharipov. The large numbers of people in the confined space of a night club made them both ideal targets for a lone gunman. Meanwhile as IS loses ground in Iraq and will shortly come under further pressure in Syria its obvious response is to goad vulnerable individuals to undertake attacks in the west. This is ‘martini terrorism’. Taking place at any time, in any place and using whatever is to hand. It provides a backdrop in which people become increasingly wary. A high tempo of operations would achieve their ultimate aim which is to ‘terrorise’. If people start running in random directions when they hear a car backfire and mistake it for the discharge of a weapon then IS can say its achieved one of its aims. If people get spoked that easily the resilience that normally exists at the heart of society is being fundamentally challenged. The forthcoming Fire Congress in Birmingham on 18 May provides an ideal forum in which to discuss and debate these issues. If preventing these kind of lone wolf attacks is difficult. And few would argue that it is easy, despite the assistance the security services get from the public at around 20,000 calls a year reporting suspicious behaviour. Then we simply have to be ready to try and minimise the impact of those attacks. Preparing emergency services staff to deal with such attacks and enabling them to function during and after an event has never been more important. Organisational resilience comes from individual resilience. If we are moving away from the isolated attack where people have time to recover to the edge of a situation where attacks are more frequent then we simply have to take initiatives to make people more resilient. 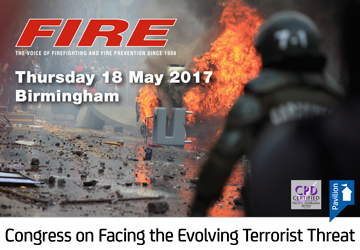 The FIRE Congress on Facing the Evolving Terrorist Threat will be held on the 18th May at the West Midlands Fire Service Headquarters in Birmingham. The theme of the Congress training conference is: Improving Multi-Agency Resilience in the Face of an Evolving Threat.